Happy almost Valentine's Day everyone! Don't go crazy trying to make last minute reservations at an overcrowded/overpriced restaurant. This year, create a romantic dinner at home that your significant other is sure to brag about at work the next day. You can become an expert with a few of our helpful tips. Here are our favorite tips to keep your dinner romantic and stylish. 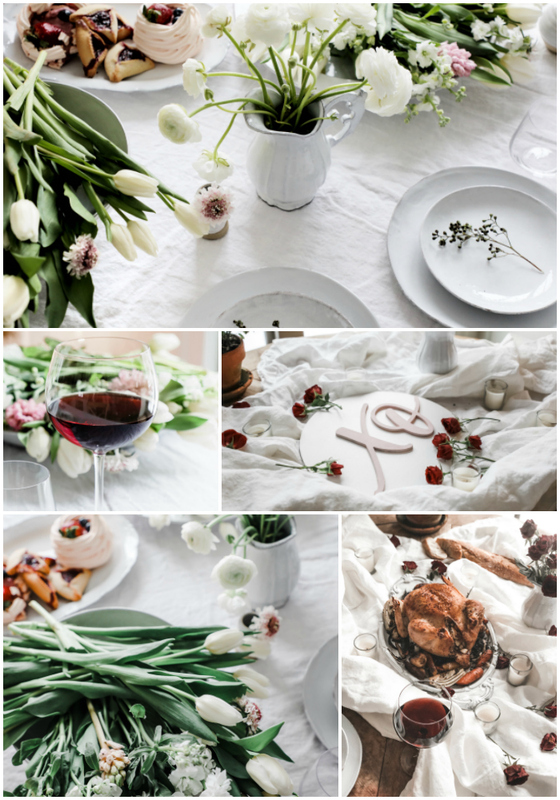 Choose your favorite white linen tablecloth. We can't think of a better reason to bust out your favorite linens! Break out the fancy china. This is your chance to finally use your wedding gift and not have to worry about guests breaking it. Flowers. The more the merrier. We love a more non-traditional look! Try laying flowers in a bowl instead of a classic vase. Plan a delicious and savory menu based on your preferences. Our go-to is a classic roasted chicken and veggies. Paige of NE Occasion made this one for us, but here is one her favorite recipes. Don't forget dessert! Our latest obsession is Merenges, they're beautiful and delicious! We recommend picking these up. Choose your favorite wine and enjoy responsibly throughout the evening; this includes during cooking and decorating process! Enjoy each others' company. After you take a few snapshots of the table, put the cell phones away and engage with your significant other! Make sure to have some light music on in the background. We recommend smooth jazz or an international cooking station!